An outdoor fireplace will add warmth and create a cozy atmosphere in your Oyster Bay, NY, backyard. A gas fireplace be convenient, but it’s hard to compete with the natural beauty and inviting crackle of a wood-burning fire. Get an early start on your outdoor season by adding a beautiful wood-burning fireplace to your landscape. The arrival of Spring brings sunny days and warmer temperatures. But it’s still not quite warm enough to sit outside and enjoy your backyard for extended periods. The addition of an outdoor fireplace will warm up your space and extend your outdoor season. A wood-burning fireplace requires little seasonal maintenance and is ready for use as soon as the snow clears. Aside from starting your season earlier, an outdoor fireplace will also extend your summer days well into the night. And when your neighbors are packing up their patios in the fall, you’ll still be enjoying crisp nights by the fire. Like interior design, good landscape design requires a focal point. A focal point anchors your yard and helps support a landscape theme. A fireplace is one of the few features that provides a beautiful focal point day or night. The structure of a wood-burning fireplace will draw the eye and create a central feature in your landscape. Even when the structure is less visible at night, the beautiful glow of the fire will still attract attention. With almost unlimited design options, an outdoor fireplace is the perfect way to reinforce your landscape theme. Whether you have a traditional, modern or natural style landscape an outdoor fireplace will complement your landscape design. 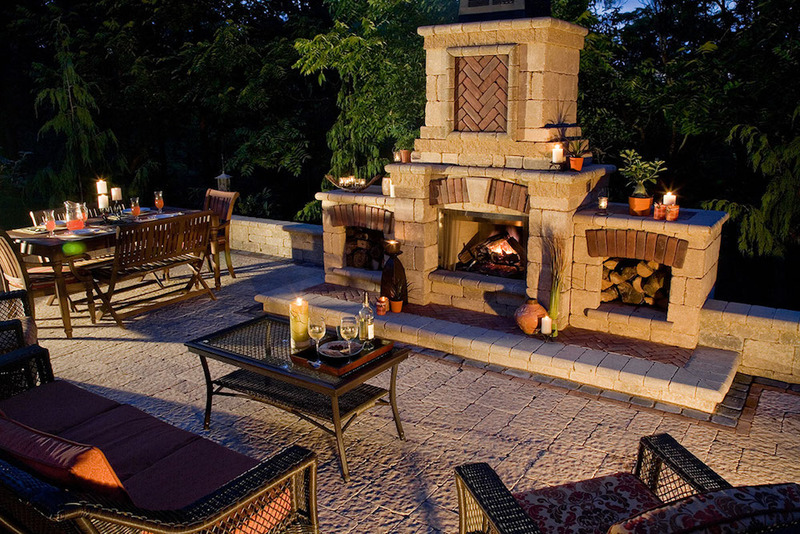 To make an outdoor room even more enjoyable, include an outdoor fireplace. The allure of a wood-burning fire is hard to resist and the added warmth will make any space cozier. Just because the sun goes down doesn’t mean you have to move indoors. A fireplace in your outdoor seating area will allow for long nights cuddled up by the fire. Adding the warmth of a fire to your outdoor kitchen or dining room will keep guests comfortable even after the sun goes down. An outdoor fireplace will also make your pool or hot tub more pleasant. Enjoy a swim or soak late in the day knowing you’ll be warmed by the fire when you step out. A fireplace or fire pit creates a natural outdoor gathering place. People are instinctively drawn to the warmth and crackling flames of a wood-burning fire. Adding permanent seating around your fireplace will invite family and friends to sit down and enjoy the warmth. Built-in seating such as low seating walls or masonry benches will help define the space and ensure there is always seating available. For less permanent seating, there are a variety of stylish and comfortable outdoor furniture options available to suit any landscape. A fireplace is an excellent way to add privacy or shelter to your backyard. Strategically placing the structure of a fireplace can help screen a neighbors view or hide unsightly objects from your view. A large masonry structure such as a fireplace can also provide shelter from the wind. A wood-burning fireplace requires a chimney as well as wood storage, which can result in a substantial structure. By incorporating seating walls around the fireplace, you can create a fully sheltered area.